Not long ago I became fascinated by Strandbeests. These amazing walking machines are the brainchild of Dutch artist Theo Jansen, who has been designing and perfecting monumental scale versions for the past 25 years. 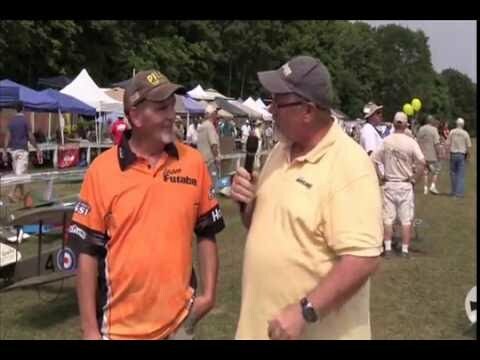 By all means visit Theo’s website to watch his captivating videos. I found out about Strandbeests – Dutch for “beach animals” through one of Adam Savage’s entertaining One Day Build YouTube videos, and I couldn’t wait to build one of my own. It turns out that kits can be purchased on eBay for just a few dollars, so I wasted no time in building a couple of them. The basic Strandbeest is intended for wind power, and on a breezy day it’s very entertaining to set a couple of them free in a smooth parking lot to wander at will. But these wonderful little mechanisms also lend themselves to radio control operation. 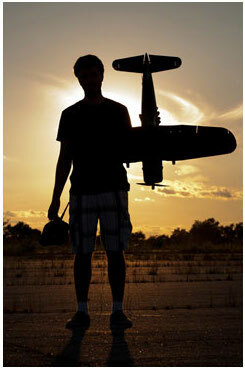 I must give credit for the radio control concept to my longtime friend and flying buddy Mark Wolf. I made a few changes to make the drive system a little more compact and to improve handling. 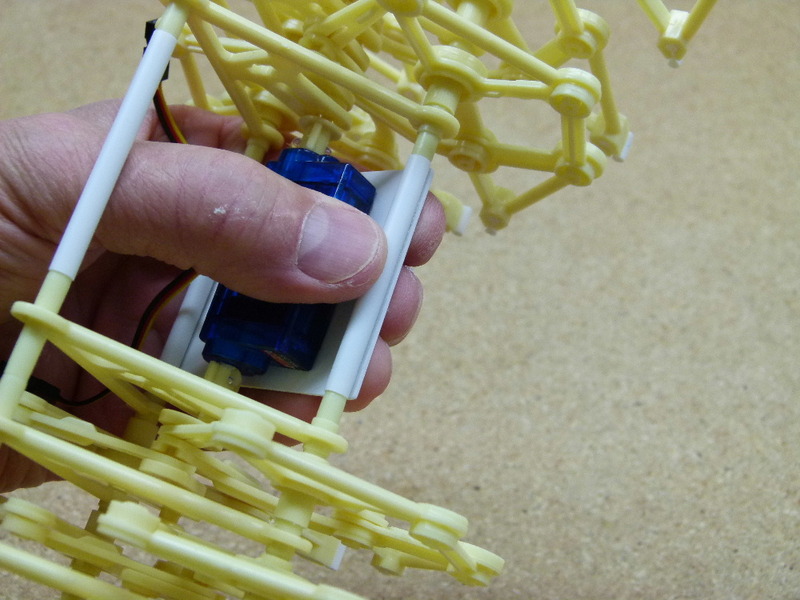 Following are a few simple steps you can follow to build a Strandbeest of your own. 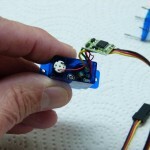 2 X sub-micro servos – Hitec HS-55 or similar. 4 X 2.5K 100 milliwatt resistors. 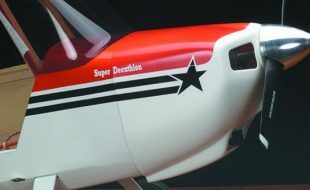 External BEC unit – Suppo 3A or similar. 3 X 8-3/4″ pieces of 0.078″ music wire. 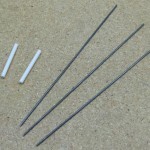 3 X 2″ pieces of 3/16″ styrene tubing. 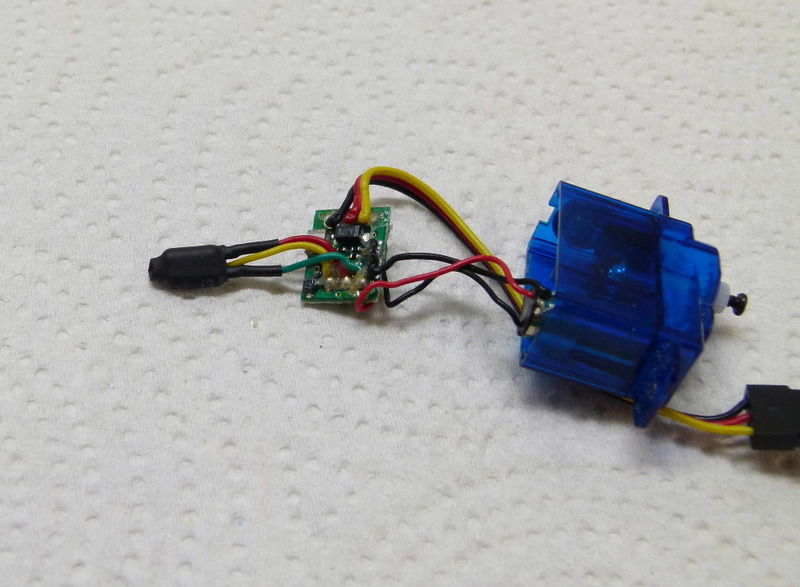 The only part of this project that’s at all complex is converting the servos from 45° travel to continuous rotation. 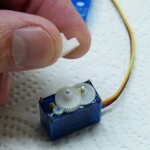 Online suppliers like ServoCity.com provide converted versions of some servos, but I haven’t found anyone offering continuous rotation sub-micro servos. 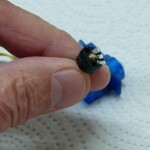 The following photo how-to shows how to accomplish this conversion, using Hitec HS-55s as an example. 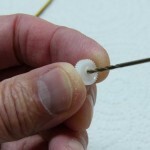 Loosen the 4 case screws and gently remove the top of the case. 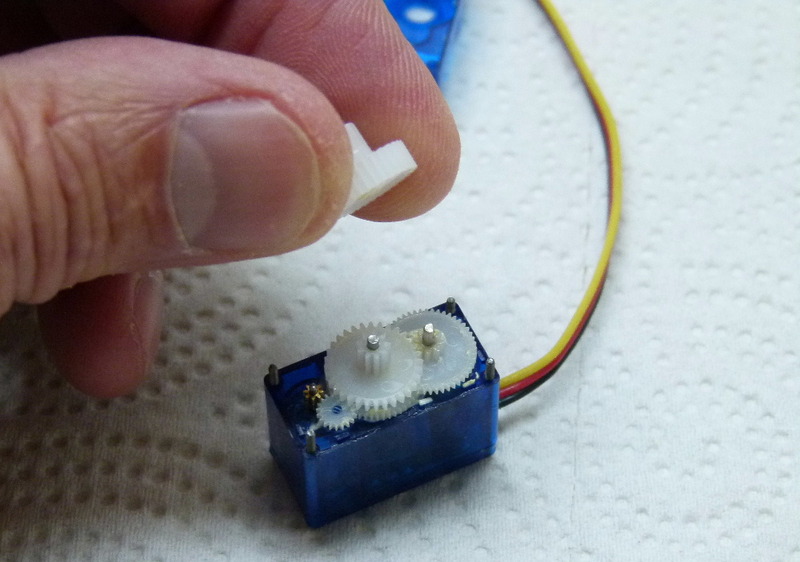 In Hitec HS-55s there’s a small tab next to the hole for the output shaft that prevents the gear over-rotating. Carefully nip this tab off with a #11 blade. Gently pry the output gear off the pot shaft. 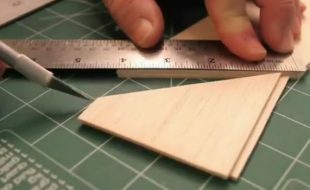 Use a 1/16″ drill in a pin vise or cordless drill to carefully ream the hole in its base. 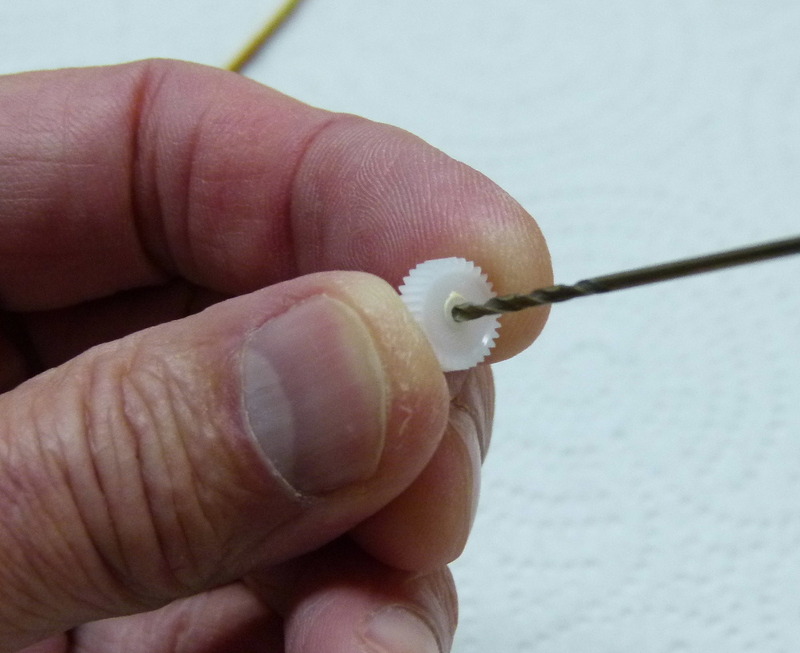 This will make the gear a loose fit on the pot shaft so that it rotates without turning the pot. Replace the gear on the pot shaft and replace the top on the case. 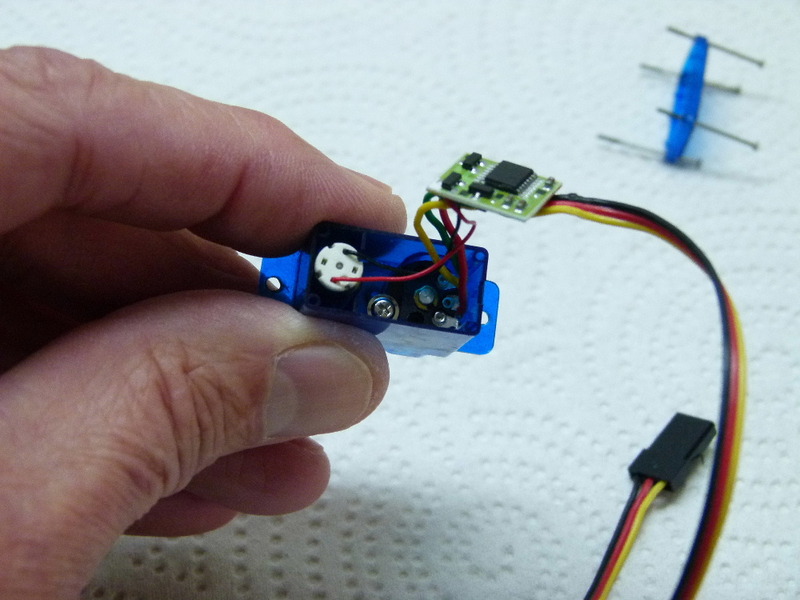 Now remove the bottom of the servo case and wiggle the amp (the small circuit board) free. Inside you’ll see the feedback pot, which in the case of HS-55s is held in place by a small Phillips screw. Remove this screw and wiggle the pot out of its socket. Note the colors of the wires connected to the pot. 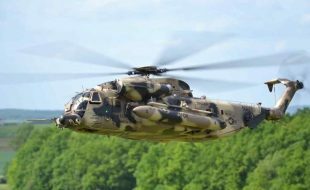 On HS-55s the center wire is yellow, and the others are red and green. 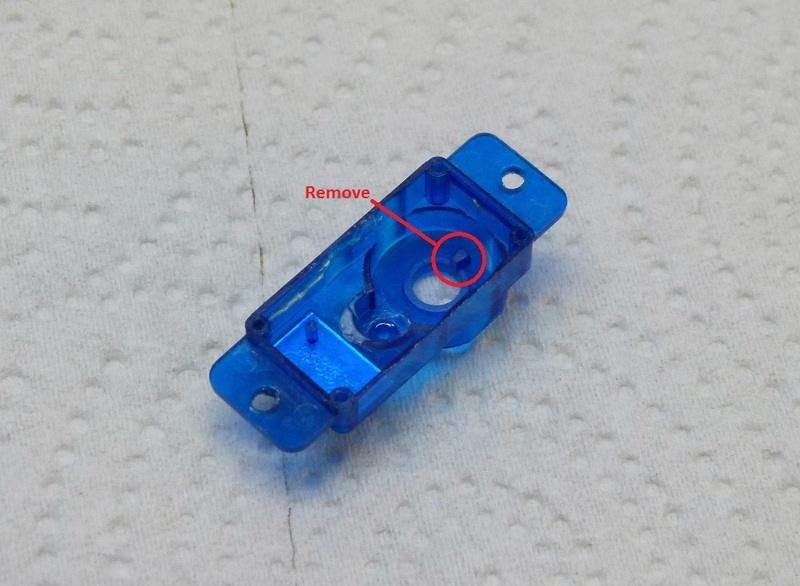 Snip the tabs off the pot, replace it in its socket, and replace the retaining screw. The pot is now out of the circuit and is only providing a pivot for the output gear. 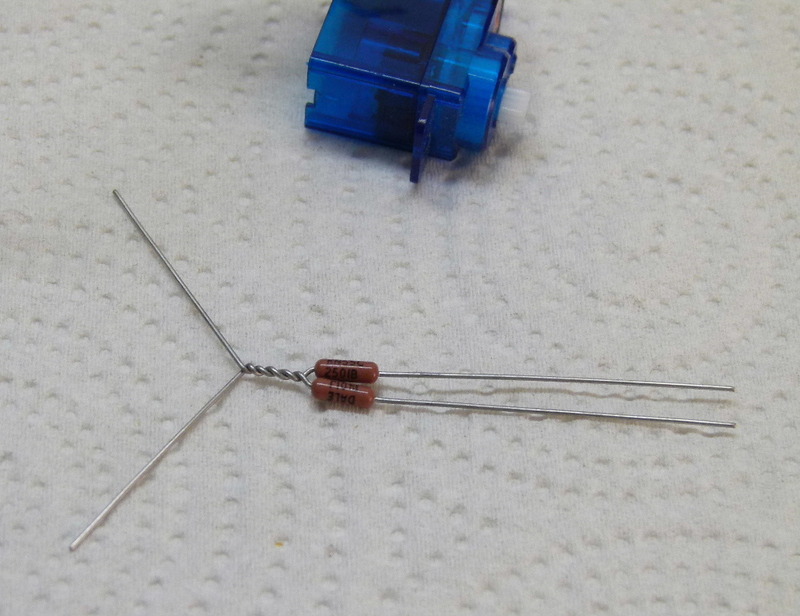 Twist a pair of 100 milliwatt or 1/8 watt 2.5K resistors as shown. Solder the lead that was connected to the center tab on the pot (yellow in this case) to the twisted connection, and solder the other two leads to the free ends. 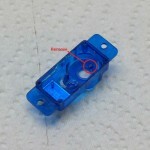 These resistors replace the pot so that the servo will rotate at variable speed in either direction. 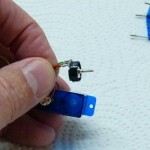 Tidy things up by covering the resistor bundle with shrink tubing. 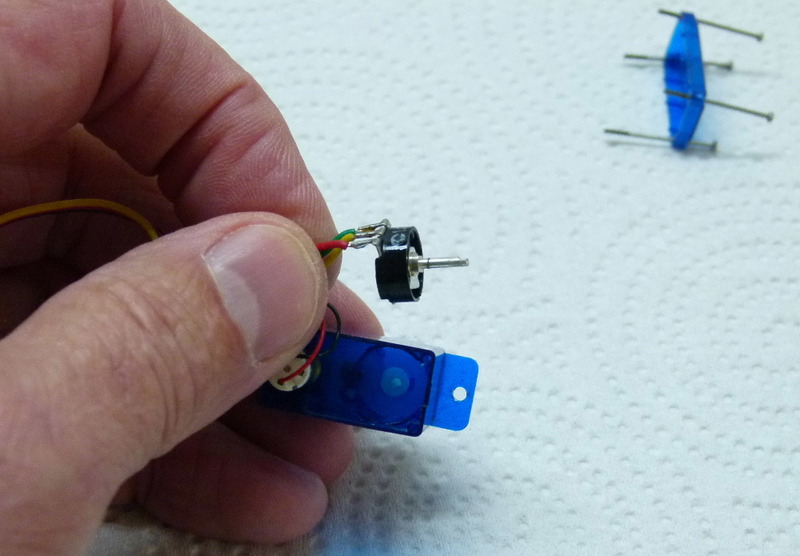 Carefully stuff the resistor bundle and amp board back into the case and reassemble the servo. That’s it! Repeat this process for the second servo. 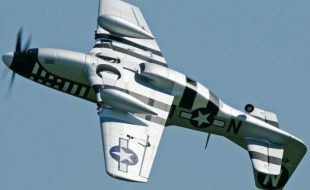 If you haven’t built one before, the Standbeest kit looks a little bewildering, but there are a couple of factors in your favor. First, the instructions that come with the kit are absolutely first-rate; the illustrations are excellent, and the text is written in very clear English. 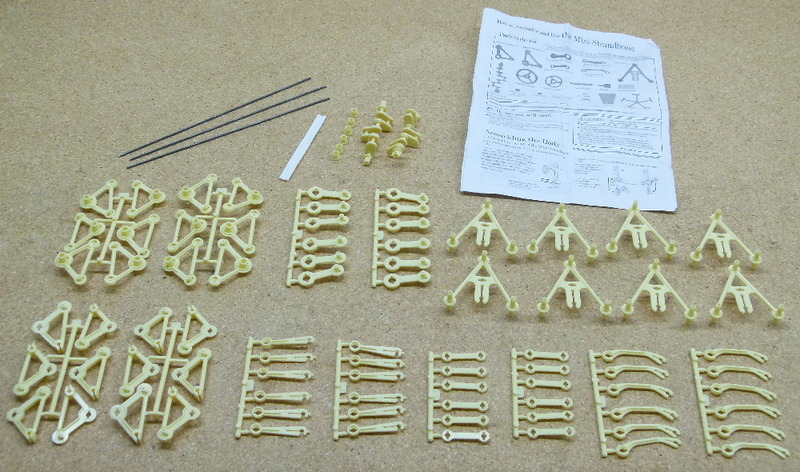 Second, while it seems like a lot of parts, you’re really just making the same leg sub-assembly twelve times. 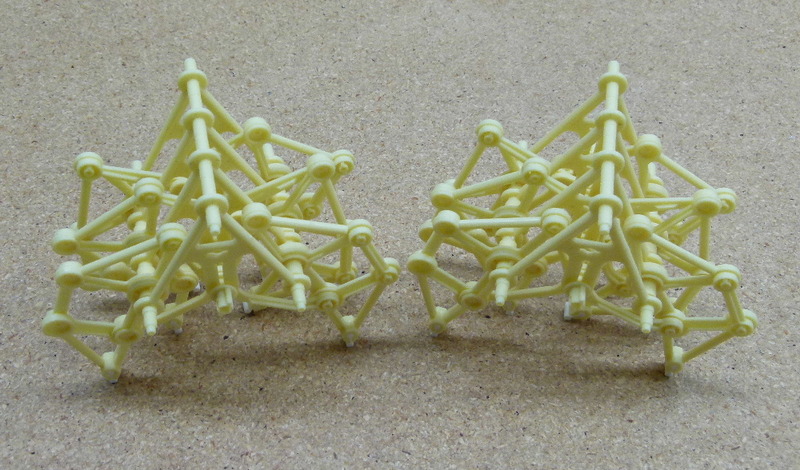 These sub-assemblies are then built up into a pair of half-frames. It’s really a pretty easy and rather fun project. 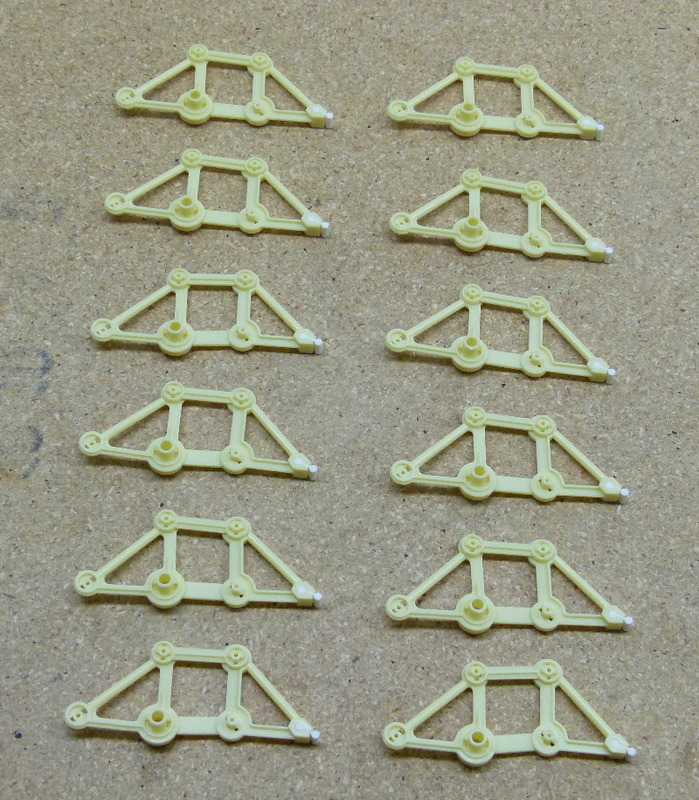 As you can see, the 12 leg sub-assemblies are identical; once you figure out the first one, the rest are easy. 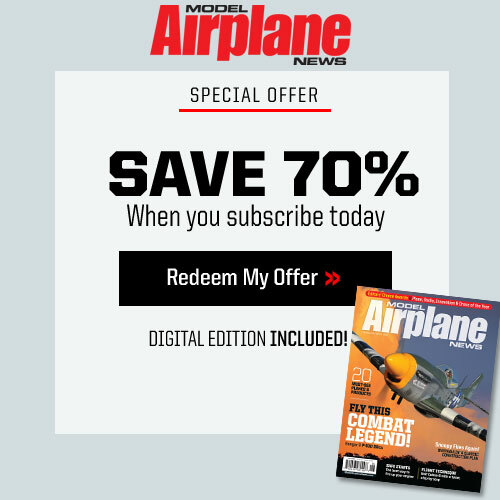 While assembling, please check each piece and trim away any flash or mold debris on the mating surfaces – you want the finished assembly to be as low-friction as possible. 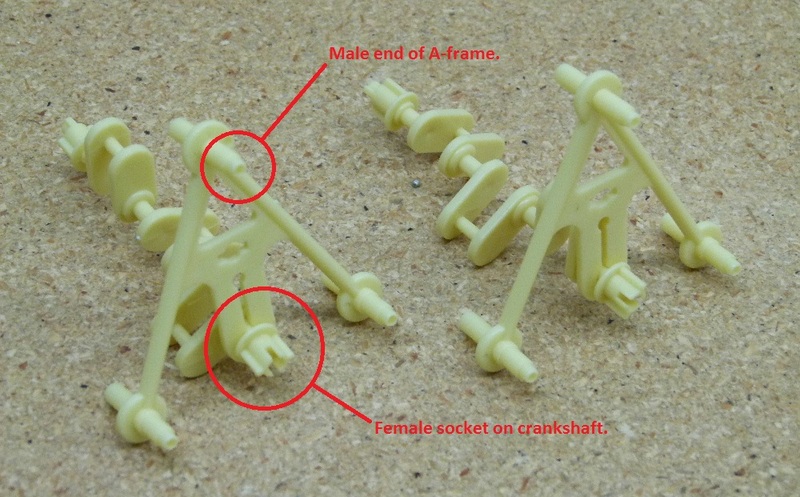 The only place where the radio control Strandbeest assembly deviates from the stock plans is that when assembling the legs to the A-frames and crankshafts, you want the male ends on the A-frames and the female sockets on the crankshafts to face the same way. 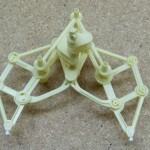 This allows the two halves to be assembled as mirror images, with the servos mounted between. 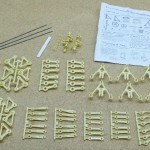 Continue the assembly as per the instructions. The two halves are identical and will be combined facing inward. 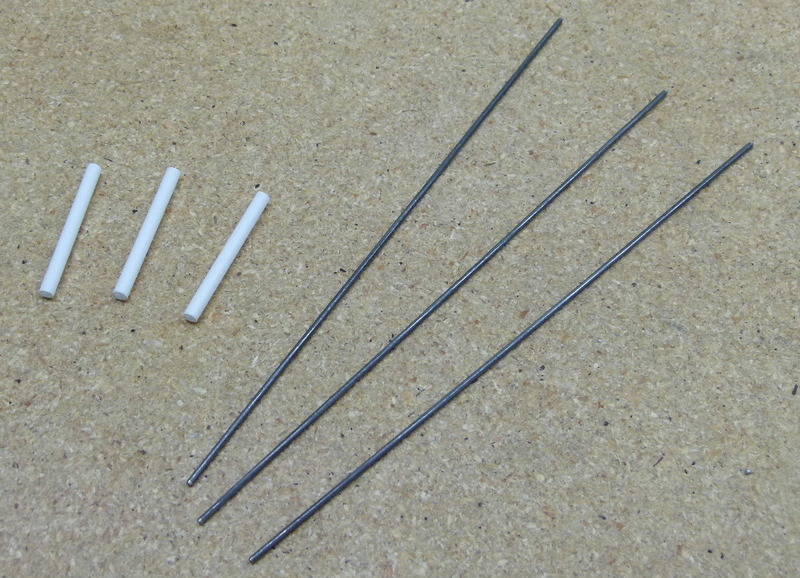 The pieces of 0.078 music wire and 3/16 styrene tubing are used to assemble the two halves end to end. 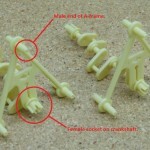 The output shafts of the servos are secured in the sockets on the crankshafts with hot melt, PFM or similar glue. 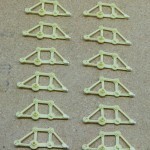 The mounting plate can be simple ply, or sheet styrene as shown here. 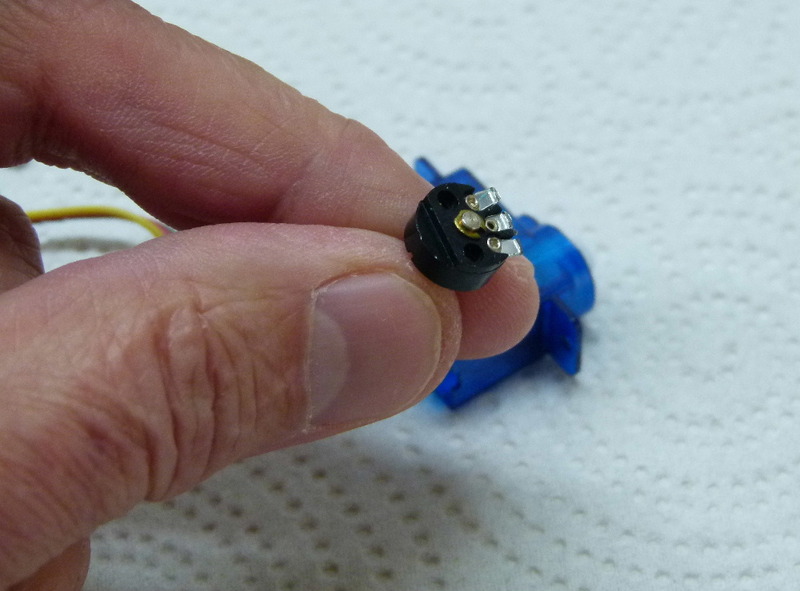 The servos can be taped or glued together. 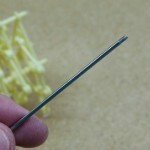 A styrene or wood spacer fits under the servos, and they’re secured to it with 2-sided tape. 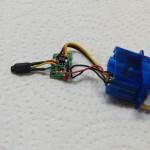 To save space, I bundled the micro receiver and U-BEC unit together with shrink wrap. 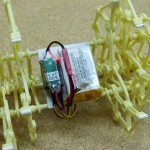 The 2S lipo battery is mounted with Velcro. 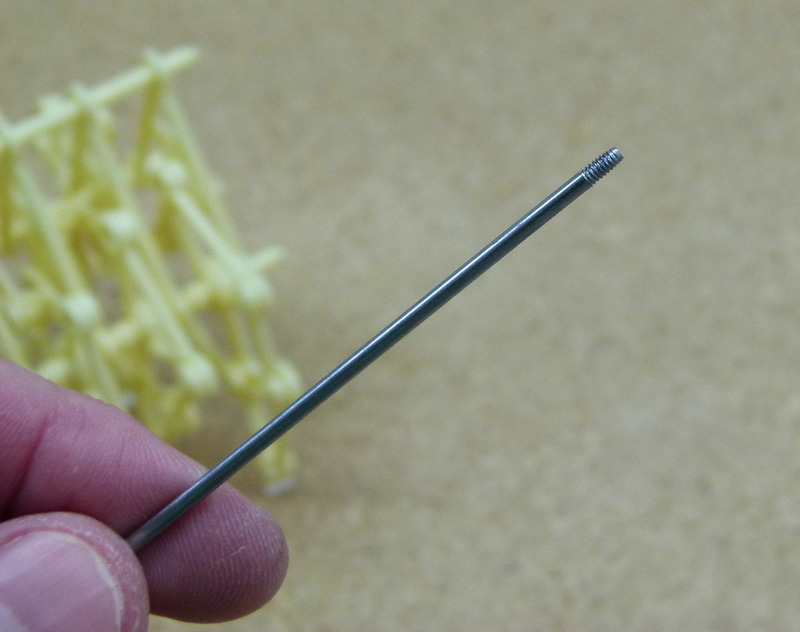 The stock Strandbeest is held together with a figure-8 rubber band, but I decided to anneal the ends of the top music wire rod and thread the ends to 2-56. 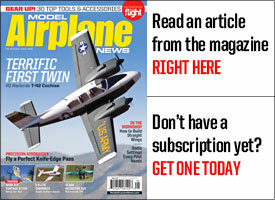 For details on threading music wire, refer my HeliTalk column in the July, 2015 issue of Electric Flight. 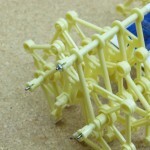 Install 2-56 nuts on the ends of the threaded music wire to hold the Strandbeest frame together. This completes the assembly. 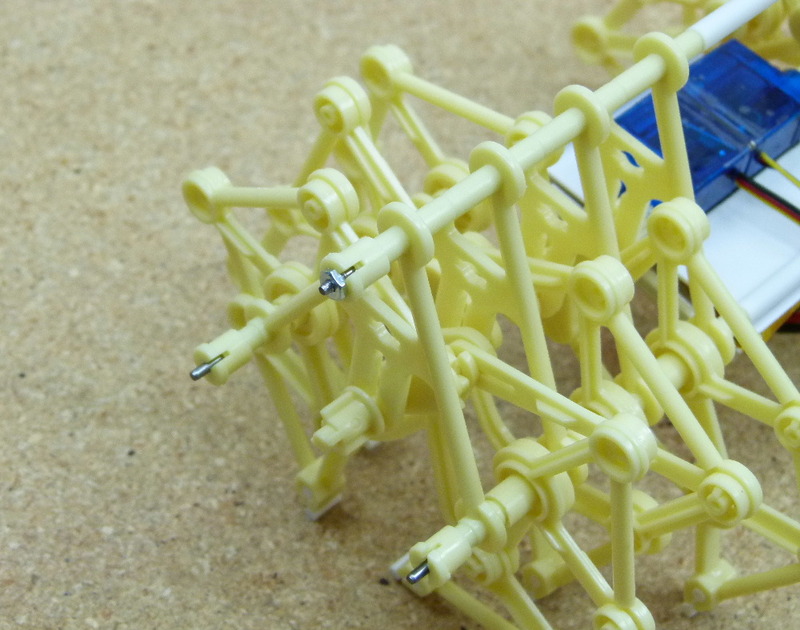 The finished Strandbeest is ready to go. 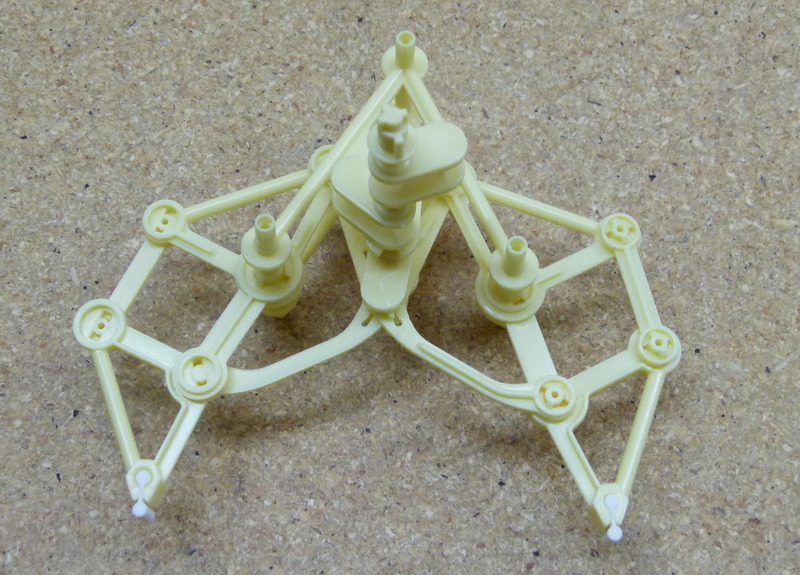 I added a vacuum formed shroud to my Strandbeest to give it a little more finished appearance. 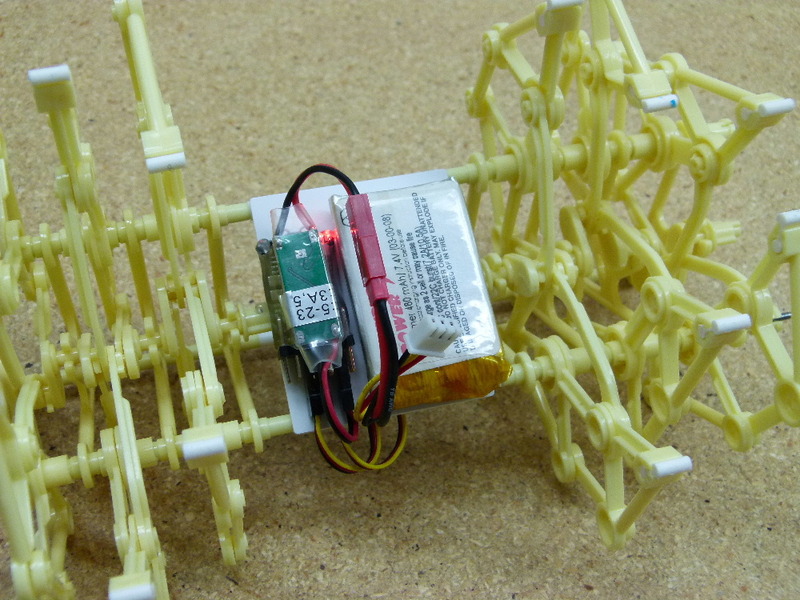 Radio Programming: The last step in in the project is to program the Strandbeest into your transmitter. 1. 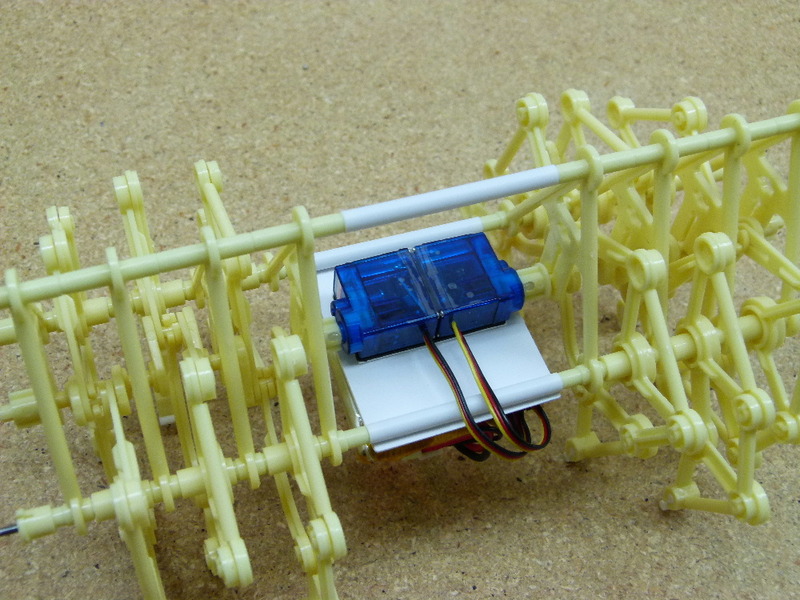 Program the Strandbeest using an airplane template. 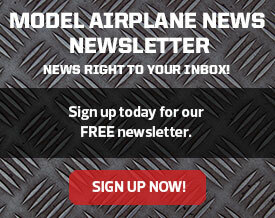 Set the wing type to elevon or delta wing. 2. 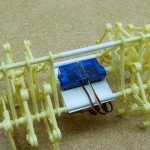 Connect the servos to the aileron and elevator outputs on the receiver. 3. 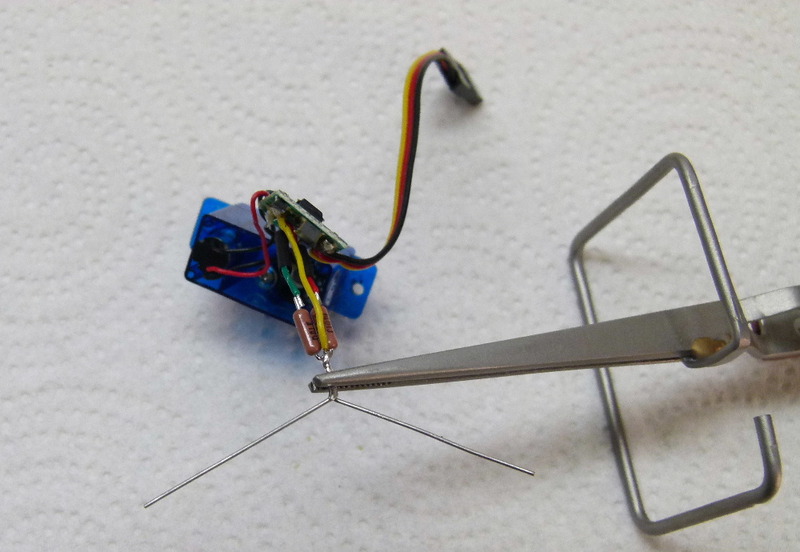 Bind the receiver to your transmitter. 4. 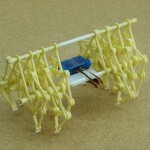 When you first turn on the Strandbeest you’ll probably find the legs slowly crawling in one direction or another. 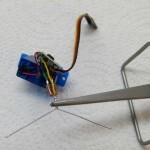 Use the trims on your transmitter to adjust the neutral points so that with the stick centered the servos are stopped. 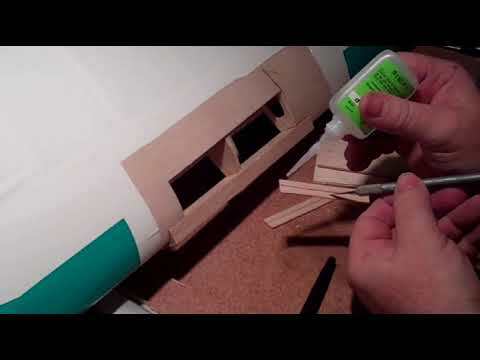 Depending on your brand of radio this will take some trial and error, adjusting both elevator and aileron trim. That’s it! 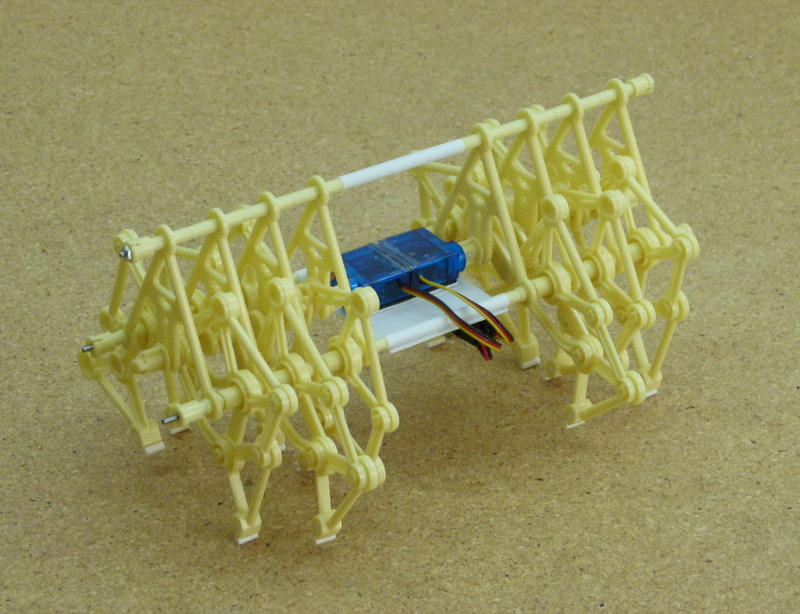 Your Strandbeest is now ready to run. 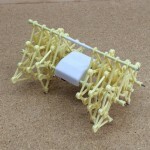 Moving the stick up and down will make the Strandbeest walk forward and backward, and moving it left and right will cause it to pivot in place. 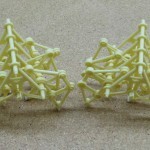 By moving the stick diagonally the Strandbeest will walk in a curved path. 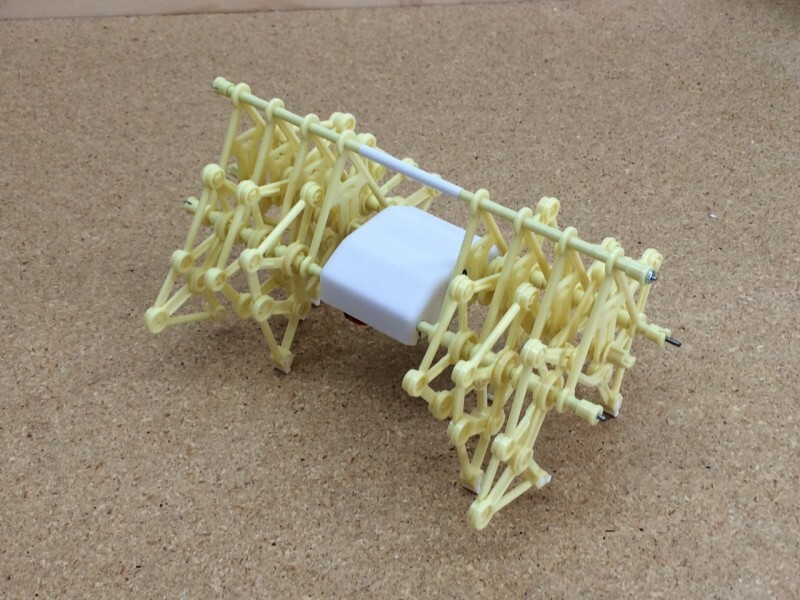 While the Strandbeest can negotiate carpet, I advise running it on a smooth hard surface to minimize wear and tear on the drivetrain. 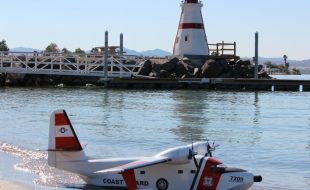 Be sure to check lipo charge level periodically; U-BEC units generally lack the low-voltage cutoff feature of a regular speed control, as they’re designed to power the radio no matter what. I hope you find this project as enjoyable as I did. 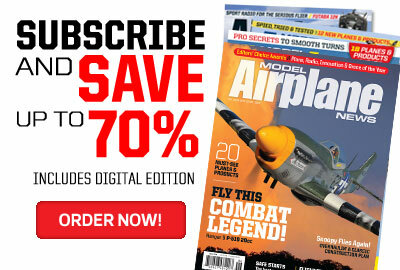 Very cool idea. 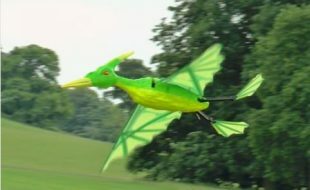 Can you provide a link to the kit you bought? 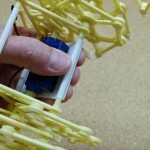 Very cool science project for school project I like to try one for sure. Yes that would be a great idea so where is the link to getting the kit? Send me a email of it please. With the demise of Radio Shack, where’s the best place to buy the four resistors needed for this project? Think I’ve got everything else lined up now. 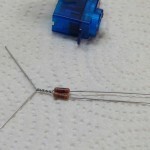 Can I substitute 2.4k ohm 1/8 watt resistors for the 2.5k ohm 100 milliwatt ones specified?